This is a sale for a brand new genuine 03-07 Honda Accord EX LX K24A CL7 Euro R K20A , 01-05 Honda Civic EP3 Type R K20A , 06-11 Honda Civic Si K20A , 07-10 Honda Civic FD2 Type R K20A , 02-06 Honda Integra Acura RSX K20A Mainshaft Ball Bearing 28x72x18 from Honda Motors, Japan. It will fit the aforementioned applications. It may also fit other applications. Buyers uncertain of application, please email us. The Honda part number 91002-PPP-003 is interchangeable with 91002-RAS-003. 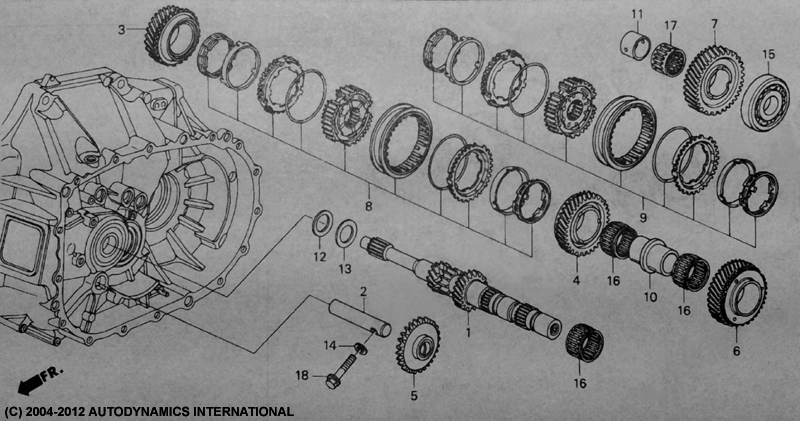 This mainshaft ball bearing (No.15 in the K-series DOHC VTEC 6MT hydraulic transmission mainshaft components diagram below) is located next to the mainshaft 6th gear.